OUT OF PRODUCTION. Kit has a copyright date of 1972. However, the re-release of the kit as kit no. 35197 in 1995 is available from 12 stores overseas, a guy on e-bay for $30.00 and at Mega Hobby for $37.72, Kit Linx for $34.95 and Sprue Bros for $36.99. During WWII, large numbers of German assault tanks were developed. This type of tank became the foundation for the expansion of Germany's tank forces. In 1936, the first A type was sent into the battlefield. But in 1941, when the Soviet - German war broke out, it was sent in to protect the infantry and help combat the attacks of Soviet tanks. The destroyer type tanks that evolved were the Jagdpanzer and the "Hunting Tiger". The type III tanks performed smoothly and were stable in all type maneuvers and the daily maintenance demanded by the German Army was easy for the German soldier and could be depended upon. The Type III was equipped with a 105 mm assault howitzer with shells included on Types A through G. About 1,000 of these tanks were produced. 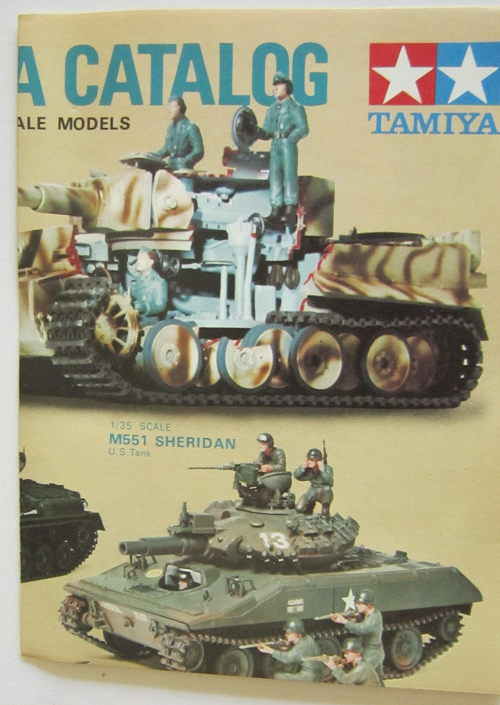 Tamiya is an old prolific model company based in Shizuoka City, Japan. The kit comes in a shrink-wrapped tray and lid type box. 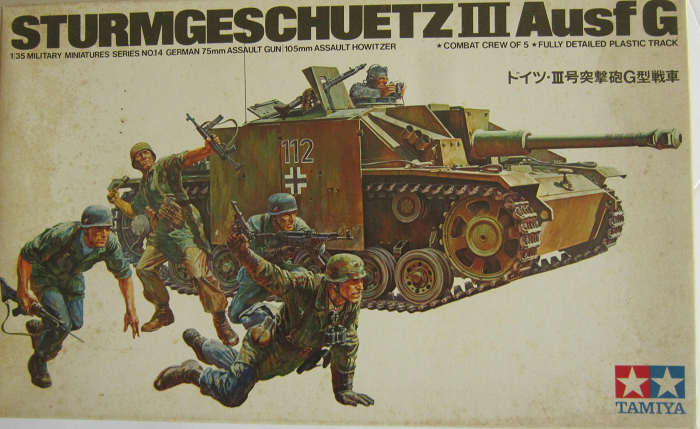 The box art shows a Sturmgeschutz III Ausf. G and 4 fallschimjager (paratroopers) posed against one of Tamiya's signature all white backgrounds, that they use for the majority of their box arts. The tank is overall sand yellow with a skeletal white cross on the side armor plate with a black number 112 outlined in white. The tank commander is looking out of the top hatch. He wears a field gray uniform with a cloth side cap and is looking through a pair of binoculars. The Fallshirmjager troops are in 4 different poses. One is a officer. He wears a smock over and his pants are bloused into low shoes. He is prone and leaning on his left hand. His right arm is raised and firing a P-38 pistol. He has a commo cover on his steel helmet and a Knight's cross around his neck. He has a canteen and holster on his belt. Behind him is another Fallschirmjager kneeling. He is armed with a MP 44 assault rifle. The third Fallschirmjager standing behind him is armed with a MP40 and is throwing a potato masher type grenade. He has a cammo cover on his helmet and ammo pouches strung on his belt. The fourth Fallsshirmjager is running in a crouch. He is armed with a MP44 assault rifle. One side panel of the box repeats the cover art smaller in color, followed by the history of the tank and 2 color front and side views of the tank showing it with and without the side armor plate. 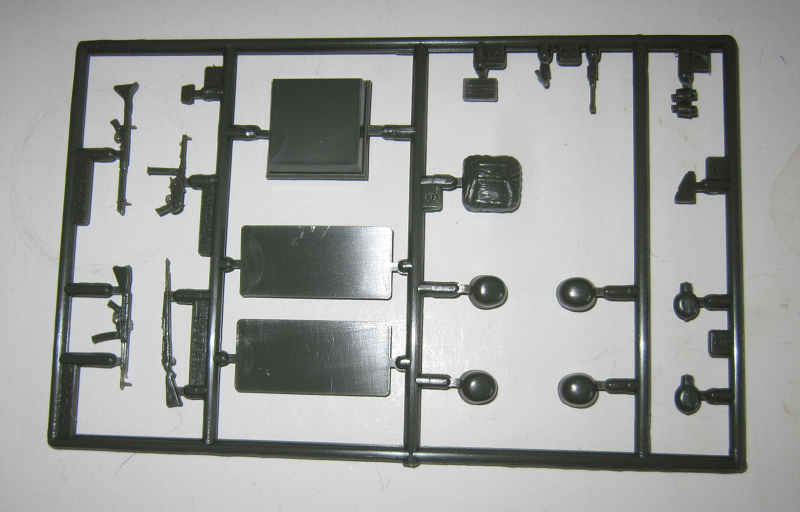 ​The other side panel shows 5 color box arts of other AFV kits that Tamiya manufactures. These are unusual as they show the tanks posed in scenes and not against the usual all-white background that is Tamiya's signature for box arts these days. Shown are: a Panther German medium tank, a Jagdpanther German heavy tank, a King Tiger German heavy tank, a Hunting Tiger German heavy tank and a Tiger I German heavy tank. No kit numbers are shown and I assume that they all are to 1/35th scale. This kit contains 3 light tan trees in 3 sealed cello bags, a loose light tan hull tub part, 2 dark-green trees in a sealed cello bag, black vinyl treads and poly caps , the decal sheet and the instructions. Plus a small color kit catalog. ​The instructions consist of a single sheet that accordion folds out into 8 pages in 7 1/2" x 10 1/4" page format. Page 1 begins with a black and white repeat of the box art over the history of the tank and a black and white photo of a Sturg III on display outdoors at Aberdeen Proving Ground, MD. Page 2 begins with the parts trees illustrations and list of the names of all the parts, above READ BEFORE YOU START instructions and the first 2 assembly steps. Page 3 though 6 give a balance of a grand total of 14 assembly steps. 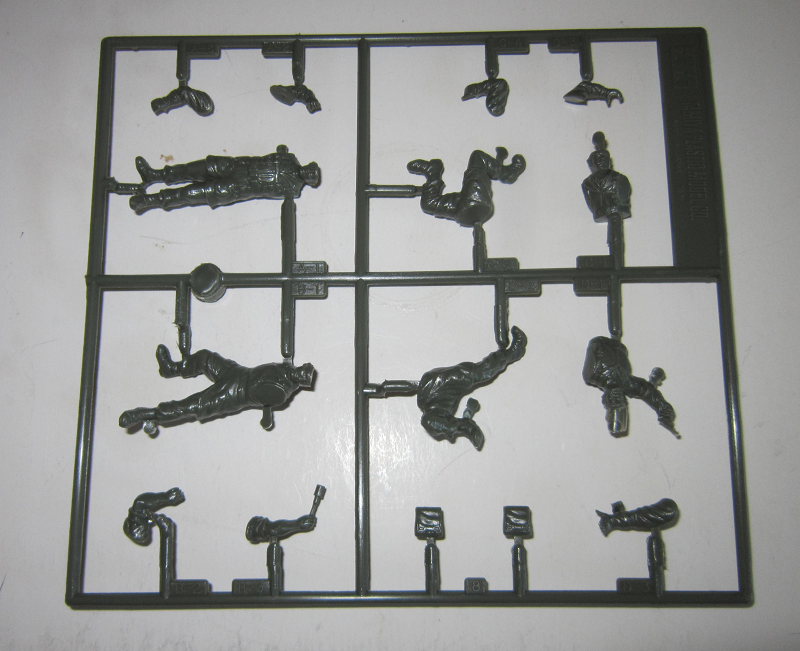 Step 14 is for the assembly of the figures. On page 3 there are also 3 more black and white photos of the tank at Aberdeen. Page 7 is the painting and marking instructions for the tank and figures. It has a side view and a 3- view of the tank. The side view shows it in a base of earth yellow with waves of green. It has a black German helmet design on the turret sides, followed by a black number 112 outlined in white and the German cross. The helmet is the sign for the Guderian Div. The 3-view is in the same camouflage. It has a black 124 over the German cross on the side armor plate. It carries a division marking of a black letter Y with a bar across it and a tactical marking for a tank destroyer on the nose and rear of the hull. This is the marking for the 16th Tank Div. 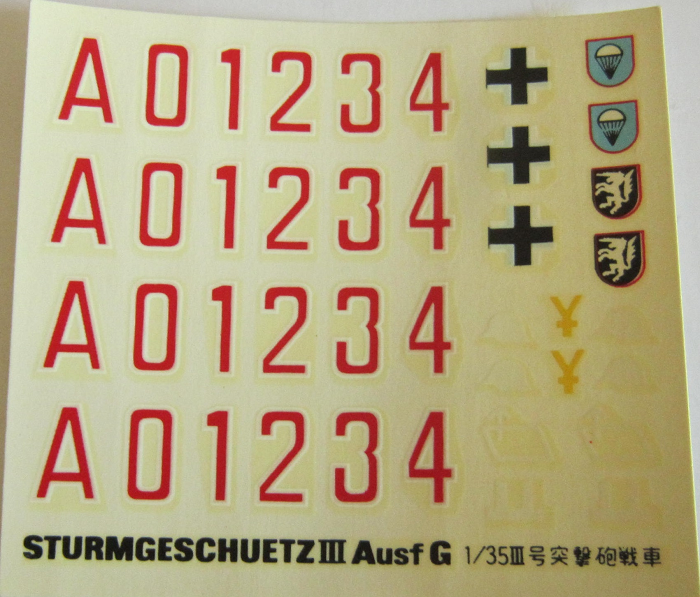 Other markings that can alternately be used are the division markings for the 2nd SS Tank Div. "Das Reich" and the 667th Independent Assault Gun Company. Camouflage is shown using cotton puffs as masking. At the bottom of the page is a black and white photo of the model made up with the 75 mm or 105 mm gun with the Fallschirmjagers. Page 8 continues the history of the tank that was started on page 1. A black and white photo of a Sturmgeschutz III inside some museum is shown. There is an organization chart of the Independent Assault Gun Brigade and two 2-views of a Ausf. E (early) and a Ausf. G (late) Sturgeschutz III. The hull tub was loose in the box. ​Trees that are not alphabetized or illustrated in the instructions are the 2 dark-green ones holding the 4 Fallschirmjager figures. ​The smaller tree holds: 2 canteens, a pistol holster, a pair of binoculars, 2 potato masher type grenades, a ammo pouch, a rolled tarp, 4 steel helmets, 3 base plates to mount the figures on, 2 MP-44's, a MP-40 and a 98K carbine. ​There are 2 runs of black vinyl rubber-band type treads and 18 black poly caps. 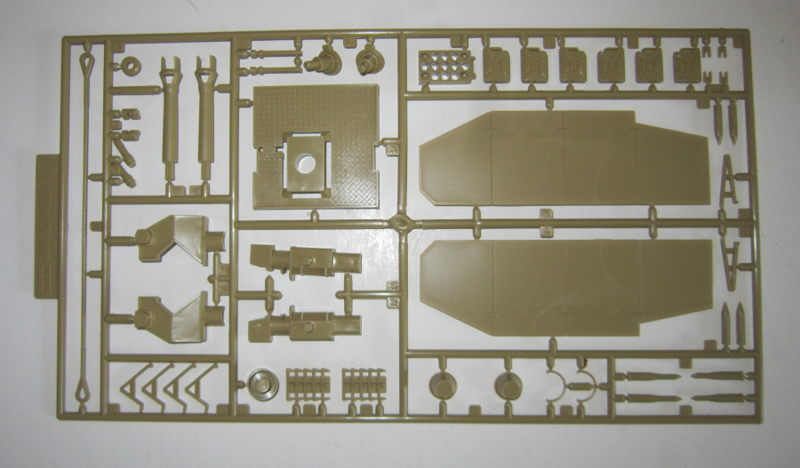 ​There is not any clear parts in the kit or any interior details. The exterior detail is nice though. 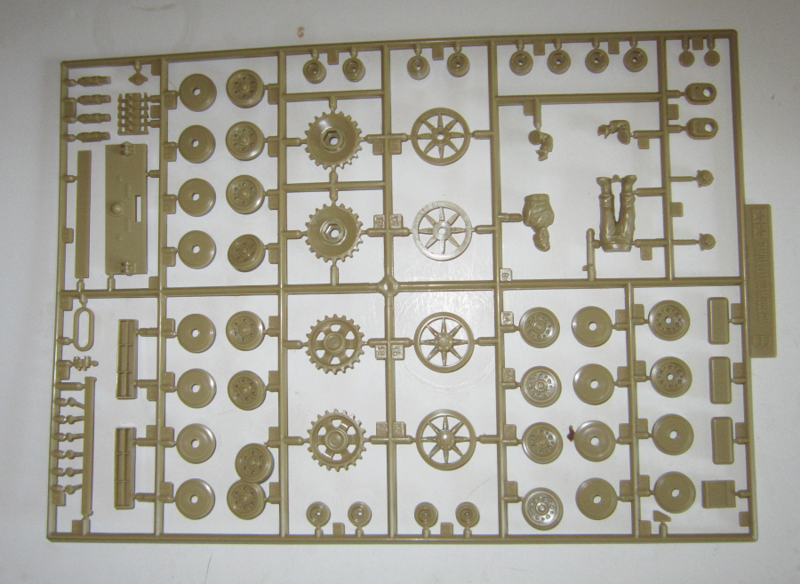 I did another review of a Tamiya Stug III version here and it's in the archives. It is the Ausf. B variant.